Fashion week has to be one of the most fun and fabulous weeks of the year, with glamorous shows, exclusive parties, street style watching and trend spotting, but it is also the most tiring! If you’ve just come back from New York Fashion Week, then add a little Jet Lag into the mix and your body will be craving a little bit of Me-Time and some mega relaxation to recover. So if you do manage to steal a few hours to yourself (highly recommended) then here are the products i’ll be using for my Fashion Week De-Stress. Before you settle into your pampering, lighting a candle not only sets the mood with ambient lighting and relaxing aroma, but they look pretty too! One of my favourite brands at the moment is La Sultane De Saba. Not just because a whiff of the scent takes me back to the time I enjoyed the most heavenly massage at their spa, but because the fragrance is uplifting and calming all at once, without being overpowering. 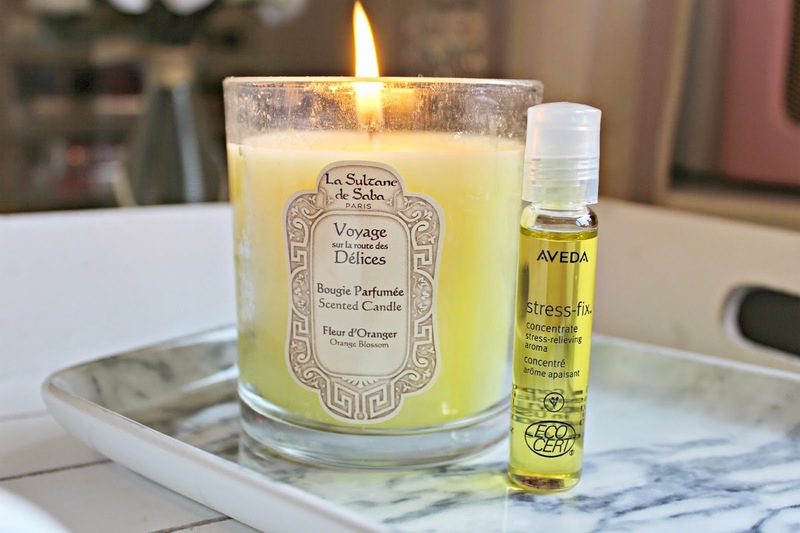 To begin the relaxation process, I apply a little of the Aveda Stress Fix to my pulse points, so that the aroma of the essential oils lingers on my skin, bringing a wave of calm every time I breathe in the scents of Lavender and essential oils. This little bottle is also one of my In Flight essentials – a quick fix for relaxing into a deep sleep to snooze away the jet lag. 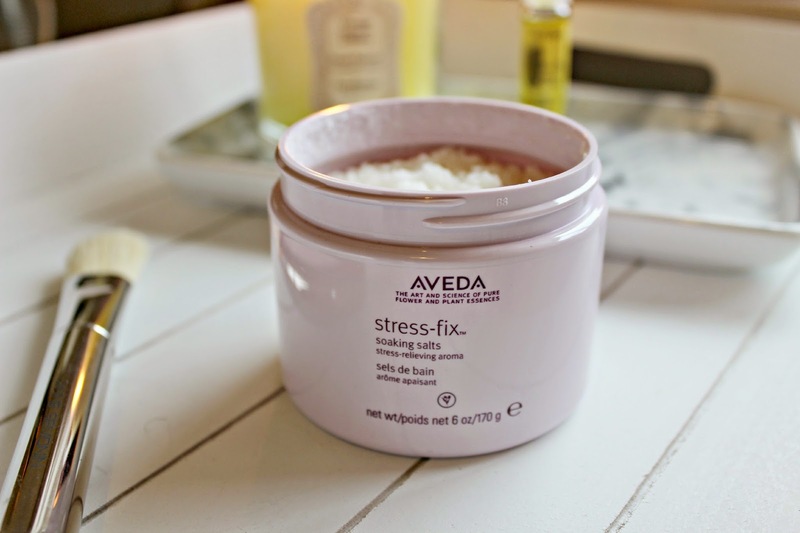 A warm bath is often the best place to steal some time to yourself and re-wind, so another product from Aveda’s Stress Fix range which I love are their soaking salts. With the same fragrance as the concentrate, the bath salts aroma is one that instantly helps you to unwind and relieve feelings of stress. Plus, relaxing in a warm bath will also help to relax your muscles after a long day of racing from show to show! While in the bath, I love to apply a face mask before closing my eyes and letting all stressful thoughts leave my mind. 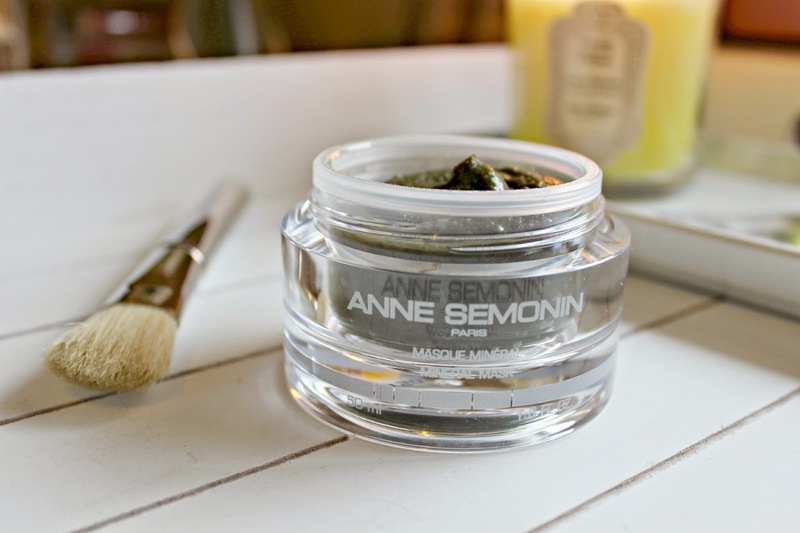 A mask which doesn’t dry out too much but still pulls all the impurities from your skin is the Anne Semonin Mineral Mask. It rejuvinates your skin and leaves you with a radiant complexion; and by applying in the bath when your pores are open, your skin absorbs even more of the skin loving ingredients. 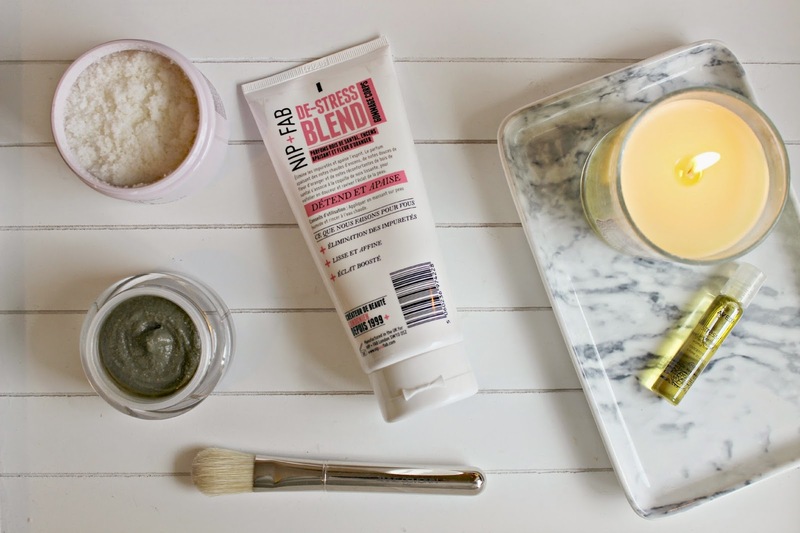 I’ve recently started applying masks with a brush, keeping your hands (and the bath water!) clean from the green clay. While bathing, a full body pampering will leave you feeling free from impurities, and the calming fragrance of Nip & Fab’s De Stress Scrub will de-stress the mind with notes of frankincense, sweet orange blossom and sandalwood blend. The walnut shell exfoliates gently and gives your skin a lust worthy glow, so you’ll be gleaming from the inside out! Finish with a luxurious body lotion, my favourite is the Nip & Fab De Stress body lotion which is a light moisturiser with the same scrumptious fragrance as the scrub, which soaks in quickly as well as having additional benefits of salicylic acid which improve skin texture. The relaxation ritual won’t end there, as every time you catch the calming scent, your mind will be comforted and ready to tackle the rest of the madness of fashion week! 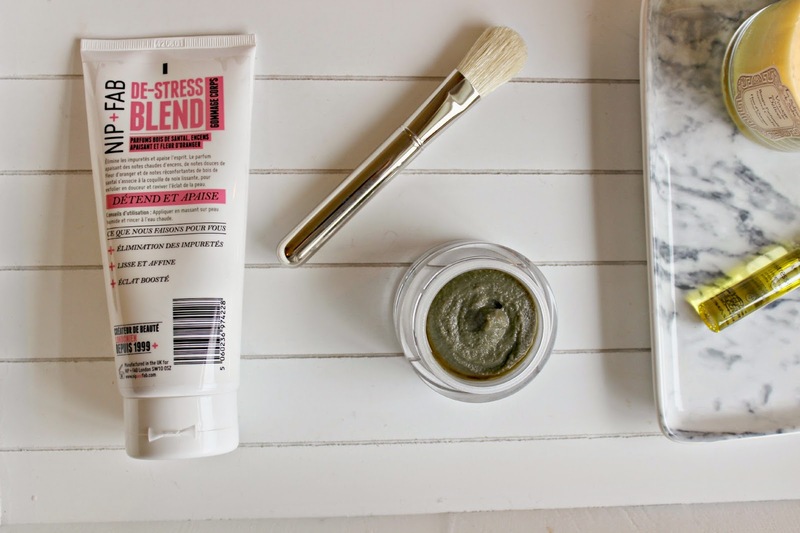 What are your favourite pampering products for de-stressing?